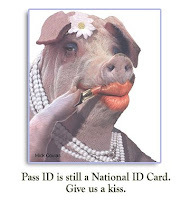 "When it was Rep. Sensenbrenner’s (the former Judiciary Committee Chairman and author of the REAL ID Act) turn to ask questions he wanted to know if the Secretary planned to extend the REAL ID compliance deadline, which is January 15, 2013. The Secretary admitted that she opposed REAL ID, but was not the only one standing in opposition, citing numerous state governors. She said "We advocated for the PASS ID Act as a replacement" and that only 22 states would currently meet REAL ID standards. Though not currently introduced in the 112th Congress, the PASS ID Act would repeal the REAL ID Act’s provisions implementing secure driver’s license/personal identification card standards. Mr. Sensenbrenner then asked when the Secretary would "drop the boom," referring to penalties such as individuals not being able to use their state issued ID to enter a federal building or pass through airport security. However, the Secretary simply responded, "It’s tough to say. We are a year away." 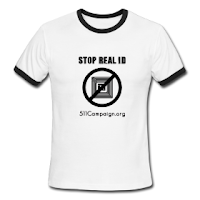 "People who are against Real ID think it's going to affect them. The people who are against Real ID and are for E-Verify don't think it's going to affect them, so it's OK," Josephs said. "It's the same scheme." FLOGGER: "Romney Supports National ID, Government Pre-Approval of Working"
Could RFID, Biometric/ Facial Recognition be classified as “intelligence-based”? Could a new ID system that is now fully integrated with the United States, complete with your own personal “threat assessment profile” be classified as “intelligence-based”? Could the tracking in REAL-TIME ALL travelers in North America be considered “intelligence based”?" The meeting comes as Canadians await the outcome of negotiations between Ottawa and Washington on a perimeter-security pact, which Harper and Obama first announced last February. The two countries are working on a deal to better co-ordinate intelligence-sharing at the border and to streamline cross-border trade.